I wired up the Rev limiter internally.. Used the Autosportlabs website as guide. Everything was simple and clear.. just connecting the solder pads to each other. Do I have to connect the EDIS coil to "coil power" on to the plug? The engine is still running without this connection. Since I installed the rev-limiter the engine runs, but I just trying to connect it to my computer keep getting timeout reading cylinder count. Comport is working correctly. - If you turn your ignition key to "on" without running engine, can you communicate with the Megajolt? - Where do you have the center +12v connection of your coil pack connected? With the hard rev limiter enabled this connects to the CoilPower on the Megajolt/E Molex connection. This is so the Megajolt can control power to the coil. Can you post pictures of the wiring of the hard rev limiter plus the wiring of the Megajolt connector? No I can't.. Tested several laptops. Comports are working ok. Strange, cause engine is running on the MJ. i am having a similar problem, a few months ago i plugged it into my home computer directly into the port and it worked ok. since fitting the hard rev limiter i can not connect to my computer to adjust the rev limiter. the light is on the megajolt and it seems to be running fine. Where do the different colored wires on the Megajolt connector go to? The coilpack is powered by the same wire as the MJ. For me it's clear this should be connected to the Coilpack Power connection on the Molex connector when the REV limiter is installed. I'll do that if you let me know this is right. But is this the reason why I can't connect the MJ anymore with my laptop? Before I installed the REV-limiter I could connect and read/write the maps, configure soft-limiter etc. 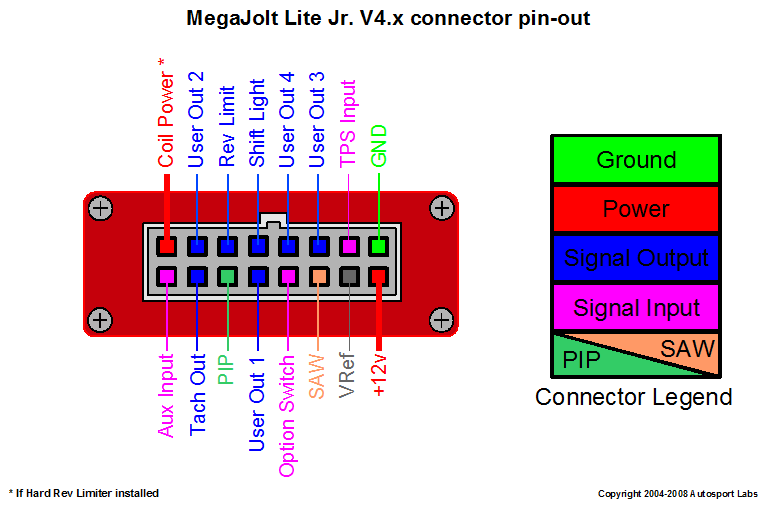 Correct, the Megajolt controls the rev limiting by controlling the coil power directly via the coil_power on the molex connector. Did you ever connect it up this way? Also, what is the gauge of the wire connecting to the megajolt? Under conditions where Megajolt controls coil power, you will need a 16 ga. wire connection and a 10Amp fused circuit, minimum. It's not clear why you cannot communicate with the Megajolt using the software after you made the rev limiter mods. * Can you pull it out of the car and power it up on the bench with a fresh 9v battery? * When you run the engine with megajolt running, can you observe the timing change using a timing light? This is another indicator for the megajolt being 'alive' and operational. The ignition advance should vary as you vary RPM. Tried 3 different laptops, 2 with USB - serial converter, 1 with serial port directly on the computer. Still no connection.. I'm desperate..
Engine is running well, I think the map I loaded a year ago is still working. The car was on the dyno last week and engine power was fine! (130hp A-series Mini Turbo). So the MJ isn't blown or something. Does the USB-serial adapter show up under device manager, as described here in the documentation? If so, what COM port is it? does it match the port settings in the configuration software? The USB - serial adapter is showing up in the device manager. But right now I'm using a computer with a direct serial port. I tested the serial to RJ11 cable adapter. It's working ok! Disconnect the serial cable;I can't see the parameters when I type. Type S or C nothing happens. Still have this problem with my Megajolt.. What could you do to solve this problem? The engine is still running fine, but I can't get any connection with the MJ to change a map of set the rev-limiter..
One question: when installed and running in the car, can you verify it is controlling the ignition timing by using a timing light? You should be able to see the timing change as RPM varies. This is a test to ensure the unit is basically 'alive' and functioning. Thanks for your reply and email! It is odd that it's working (controlling ignition advance) but not communicating. Almost all of the known failure modes involve the entire unit failing, not just one aspect of the system. If it's convenient for you, I would recommend finding a local user with a megajolt in a known working condition and try communicating with your unit using their laptop. That would be helpful to know. If that's not possible, please ping us at [email protected] and we can help you further.